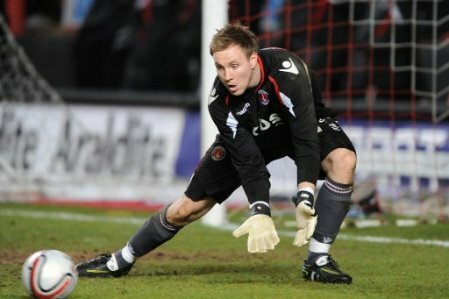 After a summer of much action within the club, but none at Charlton Athletic Online, it’s time to preview the coming season, starting with the players who will be representing the Addicks in 2011/2012. Despite Robbie Elliot (left) being rumoured to be on his way (to Newcastle - Did Pards really like him that much? 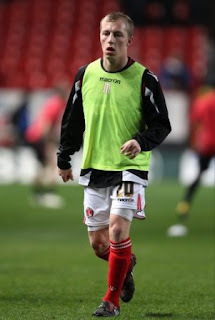 ), he remains at The Valley, and will no doubt retain the number 1 jersey. The start of last year was a bad one for Robbie, as a good pre-season was hampered by an early elbow injury that saw him miss quite a few games. Another couple picked up around Xmas and Easter saw him miss lots more games, and with Ross Worner no longer at the club, this year it looks like John Sullivan will be the bench-warmer and stand-in if Robbie gets hurt. Sullivan came in on loan from Millwall last March and did OK, but it was enough for him to get offered a contract and he is reasonable back-up. With a clutch of younger ‘keepers on the books, the third and fourth choice positions are up for grabs, and either Nick Pope or Conor Gough can expect to go out on loan I suspect. Much changed in the middle of defence, as is most of the squad, with Miguel Llera, Christian Dailly (at present), and Jon Fortune all released after their contracts ended. In have come two centre-backs, Michael Morrison (from Sheffield Wednesday) and Matt Taylor (from Exeter), and they look like taking the starting positions leaving Gary Doherty as a reserve. Young Yado Mambo is at last being given an opportunity to stake a claim, and is fourth choice at present. Both Morrison and Taylor have form in this league, with the ex-Leicester man winning promotion a couple of years ago. Taylor had very good reports from Devon, but did have a bad back injury last year which prevented him finishing the season and which may re-appear at times this year. Adequate cover is therefore required. At full back, Chris Solly (left) and Simon Francis are still with the club though Francis turned down a move to Bournemouth (after prolonged transfer fee negotiations) to try to stay near his Essex mates. On the left side, Rhys Wiggins came up from Bournemouth, not long after ex-Arsenal youngster Cedric Evina arrived. Evina has talent but may be raw, while Wiggins has not had that long in league football and may be a bit of a gamble, despite the hefty transfer fee. Their arrival probably puts paid to any hope Kelly Youga may have had of signing a new contract with Charlton, and actually news of him since he came back to the club on trial in early July has been sparse. Hopefully he is now recovered and can find a club that will play him. Unless players leave (and Francis is the only one likely to) not much more will change with the defence, although another centre back is rumoured to and probably will arrive before the end of the transfer window. This may be a loan signing...or possibly Christian Dailly coming back on a much reduced salary. Chris Powell has overseen a complete re-vamp in central midfield, with current Player-of-the -Year Jose Semedo, Therry Racon, and Alan McCormack all leaving the club for pastures new. In have come Danny Green (from Dagenham and Redbridge), Dale Stephens (from Oldham), Danny Hollands (also from Bournemouth), and Mikel Alonso (from Majorca) plus last-chance hopeful Bradley Pritchard. With Scott Wagstaff and Johnnie Jackson (left) retained, supposedly to fill the wide berths, the midfield looks entirely different, but (on paper) stronger, with much more goal threat. Green has a terrific scoring record over recent seasons (scoring twice against Charlton last season), and has many assists too, while Stephens looked a very talented player during Oldham’s unbeaten start to last year. Both cost substantial amounts but could get better and play at higher levels. Hollands arrived on a free transfer and is more solid, though he did also score against the Addicks last season. Alonso has pedigree, but will be a bit of an unknown quantity until he gets up to speed (his season in Spain only finished in early July, so his pre-season has just started (about a month late) in order to give him a rest). With Charlton having wide players like Wagstaff, Green, and Jackson all capable of getting more then ten goals a season, the pressure is taken off others, and should bode well. The arrival of Bradley Wright-Phillips (left) in January was the start of the player upheaval under the new ownership, and BWP will be looked upon to deliver at least as many goals as he combined to score for Plymouth and Charlton last year (21). His dodgy knees will need managing, and Pedro45 presumed that Paul Benson would provide adequate support when BWP needed a rest. The acceptance of a bid from Notts County recently for Benson suggests that other options are in train, but there has been confusion over why the transfer failed to proceed. Did Charlton withdraw their acceptance of the £150,000 offer, or did Benson demand a three year contract only for County to pull out? Who knows? One arrival was Paul Hayes, some years after his name was first linked with a move to south London, from Preston. Hayes should provide the support and service that BWP requires, and should chip in with a few goals of his own, though he is hardly prolific. I suggest that there may yet be another forward arriving at The Valley to supplement those in situe, and a loan option may be utilised here. Without BWP, Hayes and Benson, the current options look thin with only youngster Tosan Popo and triallist Jason Euell being out-and-out strikers still at the club. Euell is looking for a deal, and in the same way Jon Fortune did last year, may decide that it’s better to stay with those you know. If he does sign a contract, he could yet be the trump card we need in this league. With other triallists and a few signings made for the development squad too, the club have been busy putting the building blocks in place not only for this season, but for the future too. Subs: Sullivan, Evina, Doherty, Wagstaff, Benson. Coming soon, a look at the opposition for the season and a rating of the Addicks chances.